Just as one would not wisely attend Shakespeare’s Henry V as a primer for an exam on franco-anglo relations in the 15th-century, do not come to Peter Shaffer’s Amadeus, on stage this summer at the Utah Shakespeare Festival, to better understand the life of a favorite classical composer. As has been well documented, Shaffer’s award-winning play of 1979, as well as the equally honored 1984 film adaptation, has little to do with the niceties of historical accuracy. What elements Shaffer does not spin out of conjecture and rumor to create his finely woven tale of consuming envy and creative passion, he simply makes up. That is what playwrights do, after all, write stories, not histories — a fair bargain, it would seem, for audiences who come to the theatre to be entertained and not to learn — and Shaffer’s tale, directed here by J.R. Sullivan and made flesh by a talented cast, is a darkly entertaining one. Antonio Salieri is a dedicated and pious musician in imperial Vienna who has his world turned upside down when Wolfgang Amadeus Mozart, the former child prodigy turned aspiring composer arrives at court. At an early age, Salieri had made a pact with the Almighty that he would lead an upright life, his music dedicated to God, if only He would permit him to become a famous composer. After years of careful dedication, Salieri is outraged to discover that the sublime music he had aspired to compose comes forth almost effortlessly from the foul-mouthed and frivolous Mozart. Betrayed by God and frustrated at his own mediocrity, Salieri curses his Creator, abandons his life of rectitude and dedicates himself to destroying the career of his rival. All this Salieri recounts himself, thirty years after the fact, to us “Ghosts of the Future,” while he prepares to take his own life. In this role, David Ivers must slip between past and present, narrator and participant, doing so quite ably, with touches of wit and physical comedy (the actor/ director’s fortes) but also with a surprising amount of depth and passion. The play would be most accurately titled Salieri (but would anyone come? ), as the whole of it takes place as a recollection in the mind of the troubled composer: other characters are but the backdrop for the sad trajectory of his inner turmoil, including the title character. The better to raise the ire of his pious Salieri, Shaffer wrote his Mozart as a caricature of immaturity, a role Tasso Feldman plays here with gusto; but the actor is also able, in the final scenes, to bring a pathos to his character that moves us as much as it does the almost repentant Salieri. He remains a myth though, rather than a real man. Mozart’s music appears throughout, packaged neatly in the narrative so that every piece finds its inspiration in some part of the story’s trajectory. It is the type of biographical fallacy that would have had the new critics of the last century, or your pedantic musicologist friend, wringing their hands. Better to leave both at home, and bring as a date, rather, someone content to enjoy good music and a good story. 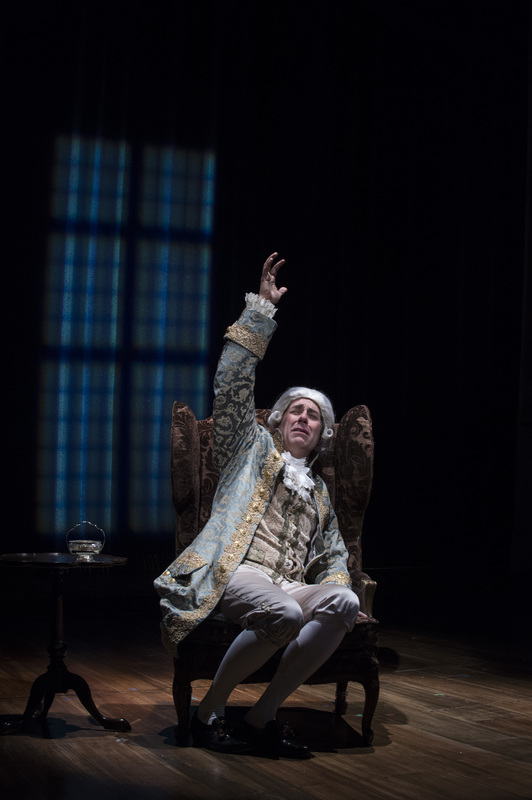 Peter Shaffer’s Amadeus, directed by J.R. Sullivan, is part of the Utah Shakespeare Festival’s summer season and continues in Cedar City through September 5. For more information visit www.bard.org. I vividly recall how, when the play and movie were fresh, reviewers in the mass media (one dares not call them critics) pussyfooting around the question of the play’s faithfulness to history. Well, it’s only Salieri, testifying from an asylum . . . . Rossiter here is not only more honest, but he gives Peter Shaffer the credit he deserves, for taking the (sadly skeletal) bones of Mozart’s biography and making from them a story that, if it isn’t actually true, would probably be more satisfying. How often in life we see this!